Coffered ceilings are both elegant and beautiful. They bring to mind the Renaissance, with all of the art, statues, and beauty of the time. Commonly found in the most expensive and expansive of buildings, they were often considered to be something that only royalty or fine museums would have. Up until the past decade or so at least. On this infographic below, Tilton Coffered Ceilings shows what every homeowner should know about coffered ceilings. More and more, everyday, modern homes are showcasing a variety of coffered ceilings. From the classic squares to the neoclassic style, coffered ceilings are the new kitchen remodel. 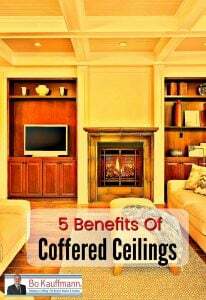 Like with any home improvement project, however, one needs to look at the benefits and see if the investment cost of coffered ceilings are worth the price. Coffered ceilings can hide a wide variety of damage or design flaws. They can cover those unsightly popcorn ceilings, turn an ordinary ceiling into a work of art and make any room instantly more stylish. For those who have very high ceilings, adding a coffered ceiling can help to reduce unwanted echoes or other types of noise transference, such as creaky floors above the ceiling and loud voices in other rooms. Any break in a flat surface will reduce noise levels, so it only makes sense to add a coffered ceiling if you enjoy peace and quiet. If your home is older and has those 8 foot ceilings, you will be surprised by how much taller a simple 4 inch or smaller coffered ceiling can add to the feeling of the room. Coffered ceilings can give the impression of height where there really isn’t any. This will give the room a taller, more expansive feel. Basements are terrific rooms that can be used for a wide variety of purposes, but let’s face it; the ceilings aren’t pretty and leave a lot to be desired. Many people leave the ceiling unfinished so they have access to pipes and electrical work, but you needn’t give up one for the other. A suspended coffered ceiling will not only allow for easy access to those important items, they give the room a finished look that will make the basement seem very much like any other room in the house. Coffered ceilings are generally considered to be a good investment as they can be relatively inexpensive to install while adding a unique look that looks classy, not tacky. Not only will you impress your guests, many realtors believe that anything you can do to a house to make it stand out from the pack is a terrific investment.